Please HELP ME: For the correct description of the pictures I am depending on other people who were present at the event or who recognize any of the persons in the pictures. If you see any mistake in the description or if you have more information or more pictures, please don't hesitate to contact me! 1-1. 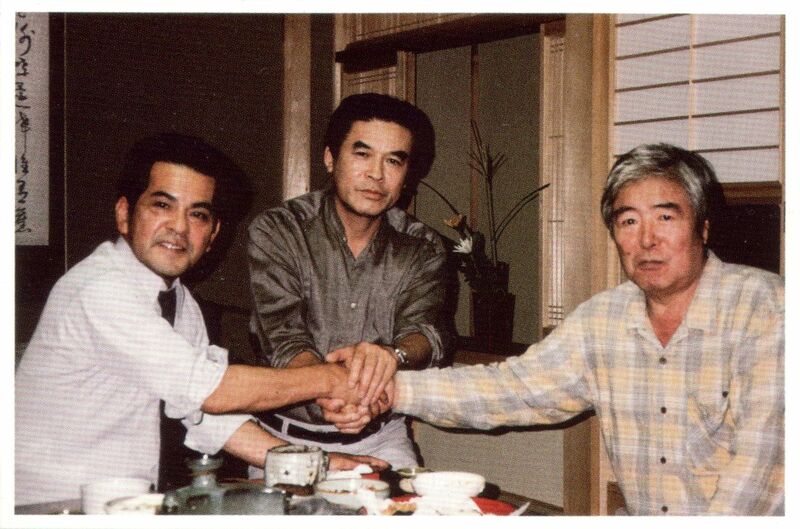 Meeting on 3 October 1990 of (from left to right) Sensei Seiken Shukumine (founder of Genseiryu Karate), Sensei Yasunori Kanai (Head Instructor World Genseiryu and President of W.G.K.F. 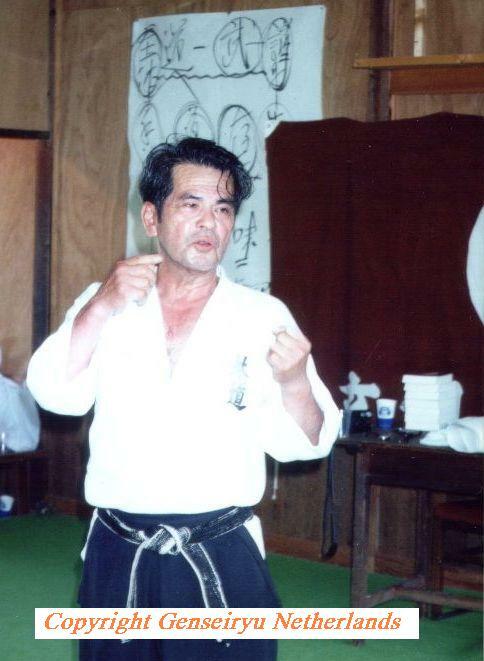 and All Japan Genseiryu Karatedo Federation) and Sensei Yamada (first Head Instructor of Genseiryu). 1-4. 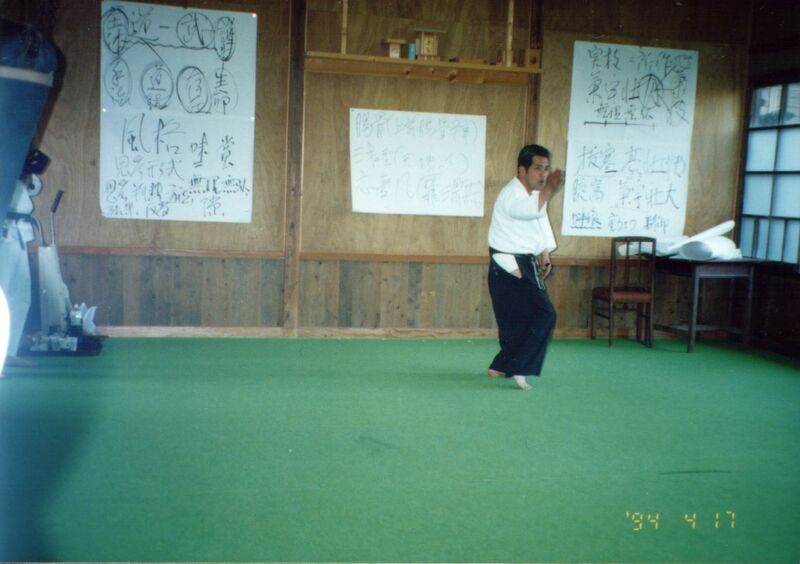 Again a picture of Sensei Shukumine giving a Genseiryu lesson (see above). 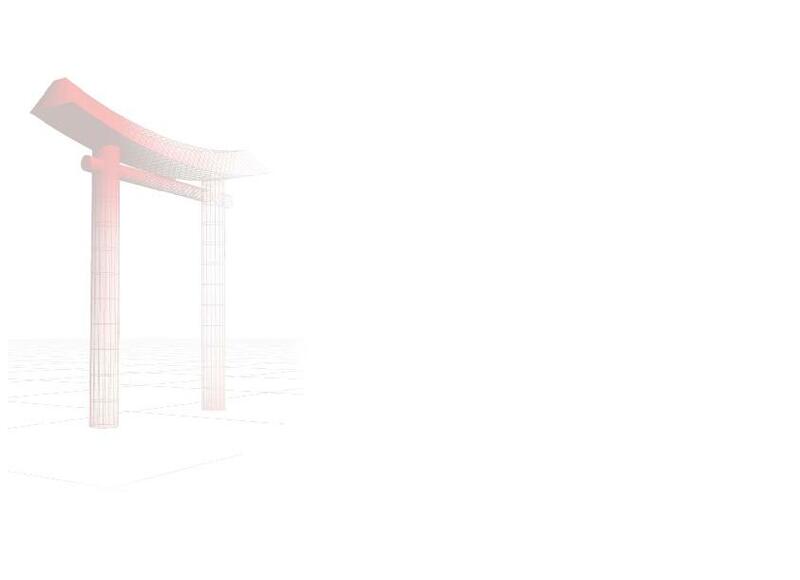 On the right you can see a part of the Genseiryu flag. 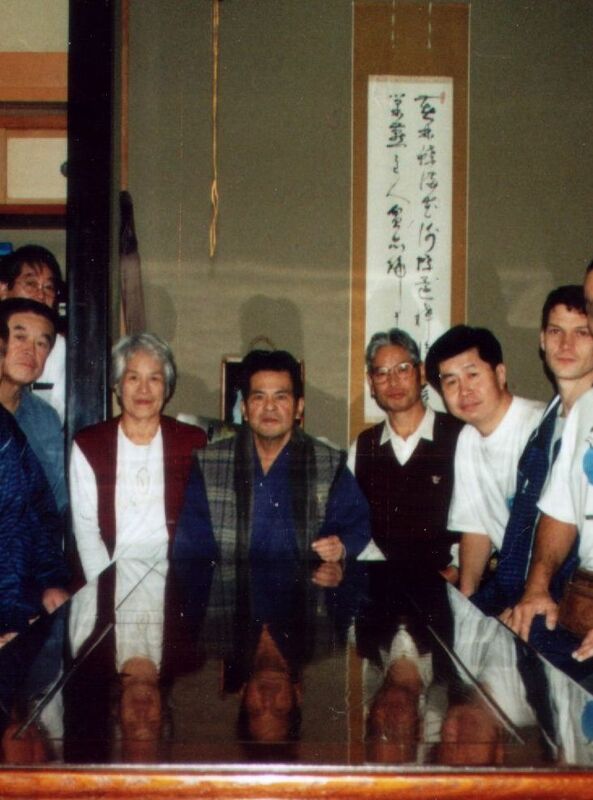 The same kind of flag was brought to Holland and is used during every Genseiryu examination or on special occasions, like the picture on the right, where sensei Suzuki visited Holland.. (Ito, Japan, 17 April 1994). 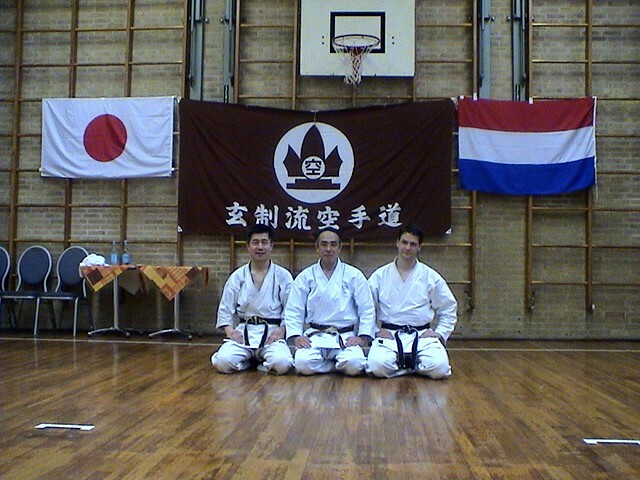 Here you can see the same flag, used during our Genseiryu exams and special occasions like this one, where sensei Shigeo Suzuki (sensei of sensei Konno) brought a visit to Holland (Anna Paulowna, Netherlands, 11 april 2005). 1-6. 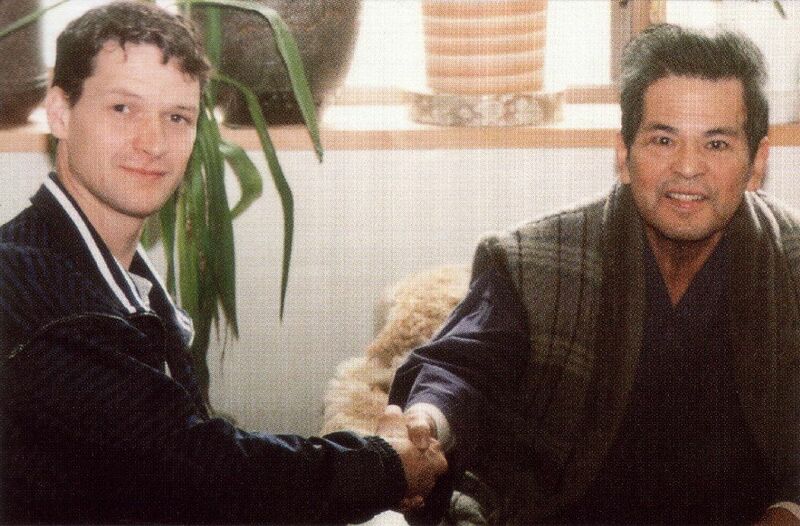 1997: Sensei Jackie Moos (Genseiryu Karatedo Denmark) meets Sensei Seiken Shukumine at his home in Japan. 1-7. 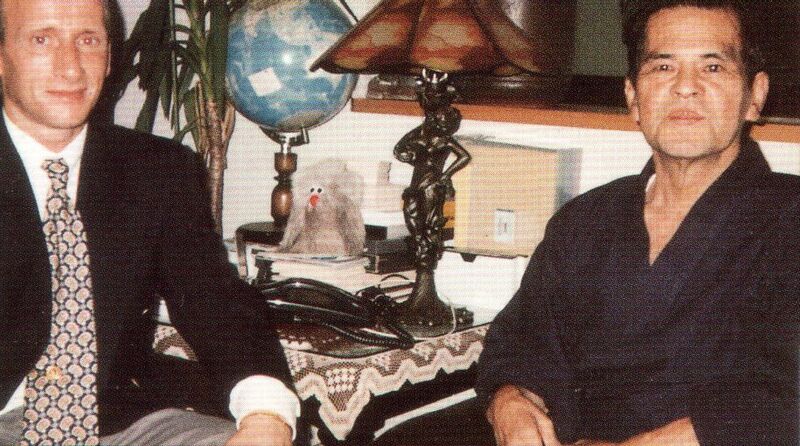 Sensei David Roovers (Genseiryu Karatedo Netherlands) meets Sensei Seiken Shukumine at his home in Japan. (October 1998). 1-8. 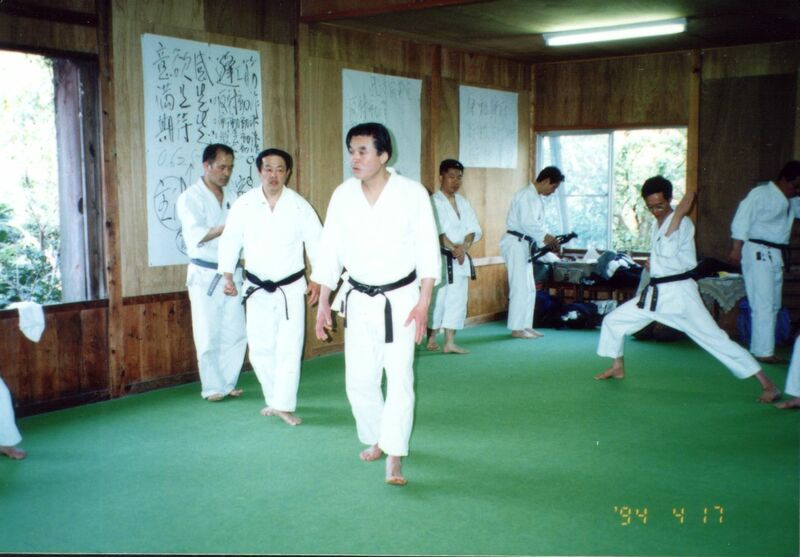 This picture is taken at a Genseiryu Tournament in Japan in Aug. 2003. 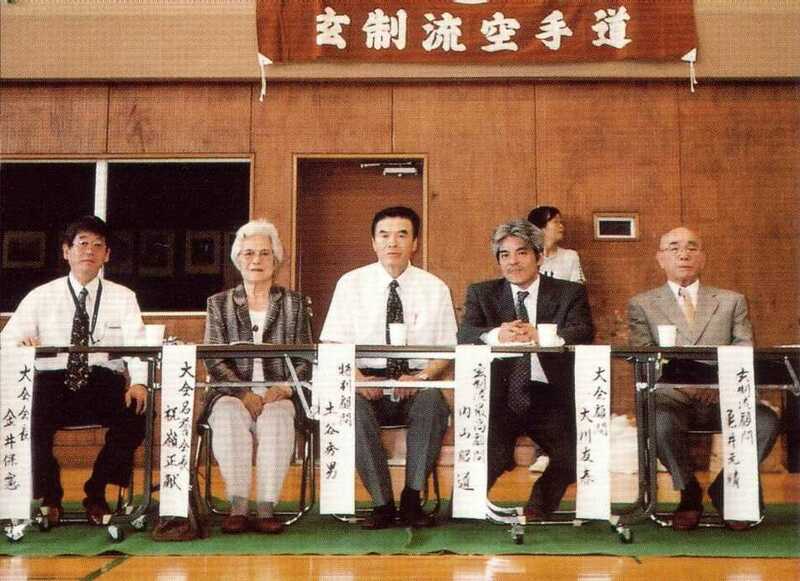 On this picture you can see: Sensei Shukumine's son (2nd on the right), his wife Mrs. Shukumine and in the middle Sensei Yasunori Kanai (World Genseiryu Head Instructor and President of the W.G.K.F and All Japan Genseiryu Karatedo Federation).